NAIROBI (REUTERS, AFP) - An Ethiopian Airlines passenger jet bound for Nairobi crashed minutes after take-off on Sunday (March 10), killing all 157 people on board and raising questions about the safety of the Boeing 737 Max 8, a new model that also crashed in Indonesia in October. The Lion Air jet crashed near Jakarta, minutes after take-off, killing all 189 on board. The cause of that crash is still under investigation. The Ethiopian flight left Bole airport in Addis Ababa at 8.38am local time, before losing contact with the control tower six minutes later, at 8.44am. The pilot had alerted controllers “he had difficulties” and wanted to turn back, the head of Ethiopian Airlines said, in circumstances similar to the Lion Air crash in which the pilot also requested he wanted to return back to the airport soon after take-off. Flight ET 302 crashed near the town of Bishoftu, 62km south-east of Addis Ababa, the airline said. 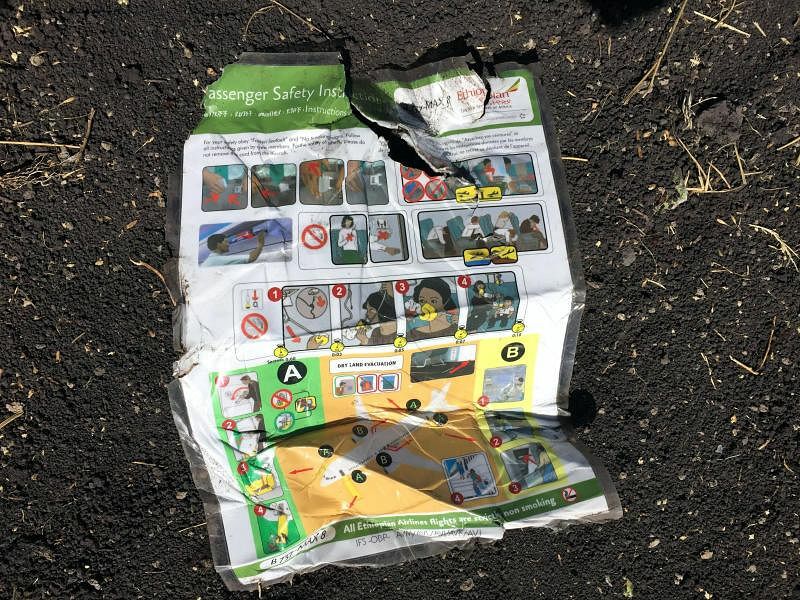 “The group CEO who is at the scene right now deeply regrets to confirm there are no survivors,” the airline tweeted alongside a picture of Mr Tewolde GebreMariam in a suit holding a piece of debris inside a large crater. Mr Tewolde told reporters the plane was nearly new and had no recorded technical problems, and that the pilot had an “excellent” flying record. “We received the airplane on Nov 15, 2018. It has flown more than 1,200 hours. It had flown from Johannesburg earlier this morning,” he said. US aerospace giant Boeing said on Sunday that it was “deeply saddened” about the deaths. “Boeing is deeply saddened to learn of the passing of the passengers and crew on Ethiopian Airlines Flight 302, a 737 Max 8 airplane,” the company said in a statement. The 737 is the world’s best selling modern passenger aircraft and one of the industry’s most reliable. The Ethiopian Prime Minister's official Twitter account expressed condolences to the families of those lost in the flight. "The office of the PM, on behalf of the government and people of Ethiopia, would like to express its deepest condolences to the families that have lost their loved ones on Ethiopian Airlines Boeing 737 on regular scheduled flight to Nairobi, Kenya, this morning," the PM's office said on Twitter. At Nairobi airport, many relatives were left waiting at the gate for hours, with no information from airport authorities. Some learnt of the crash from journalists. Mr Robert Mutanda, 46, was waiting for his brother-in-law, a Canadian citizen. “No, we haven’t seen anyone from the airline or the airport,” he told Reuters at 1pm, more than three hours after the flight was lost. Kenyan officials did not arrive at the airport until 1.30pm, five hours after the plane went down. Mr James Macharia, the Cabinet secretary for transport, said he heard about the crash via Twitter. One relative, Mr Khalid Ali Abdulrahman, however, received happy news about his son, who works in Dubai. “I was shocked, but shortly after, my son contacted me and told me he is still in Addis and did not board that flight, he is waiting for the second one which has been delayed,” Mr Khalid told AFP. The plane that crashed was among six of 30 Boeing 737 Max 8 jets the rapidly expanding carrier has ordered. The fleet will continue flying since the cause of the crash is not clear, Mr Tewolde said.